Welcome to my new web home! This space is going to be one of magic, wonder, mystique and growth. If I’ve learned one thing from these past 5 years of entrepreneurial experiments and self-employment, it’s that the only constant is change. Truly. When you’re making your own rules about how your life and business run, you can expect that each day it’s going to be different. Gone are the days when you had systems in place that you followed because you had to. There are no training manuals or coworkers that can guide you out of a place of “stuckness”. It’s just you chartering those proverbial waters of change as you navigate through day after day of changing interests, self-doubts, fears of doing things wrong, fears of doing things right, wavering inspiration, and then of course other responsibilities. When I first started my ‘business’ (if you can call it that), it looked very different than it does now. I had just had my son and I was racking my brain shuffling through my skills trying to figure out how I could make a living while staying home. It started out with me trying to replicate the type of work I did at my job before leaving on maternity leave. So naturally, I decided I would freelance graphic design and then start incorporating my passion, teaching yoga part-time. Through that process, and many stressful nights of my hubby dealing with a crying baby while I rushed back and forth from class to home for feeds, plus late nights for me trying to meet design job deadlines in the only quiet time I could find all day – I quickly realized this wasn’t working. As I continued on my journey of yoga teacher trainings and developments I had this moment of clarity where I realized I didn’t want to do graphic design anymore. So fast-forward some years in-between of working into other ventures, this is a year of new beginnings, embracing constant change, and most importantly, trusting my instinct and heart. I’ve moved across the country, I’m launching my new soul business, I’m expecting my second kiddo, and instead of cowering in my fears like I normally do, I’m feeling incredibly aligned, excited and ready to embrace the constant of change. Thanks for being here with me. Let’s do this! 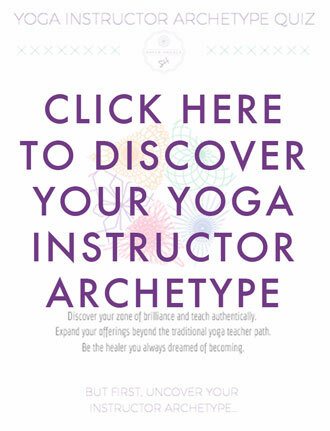 I'm an 1000+ hour certified yoga teacher, therapist and facilitator, but most importantly I'm a highly sensitive empath who's learned to deeply understand my personality and manage my subtle energy, which creates the undercurrent guiding and informing every aspect of my life. I write my experiences here. Let's connect & inspire each other!